A couple of years ago I pre-ordered a Motorola Razr Max cell phone. It came right on time, the day it was released, and was SO COOL! It was running Android and had all the bells and whistles that modern technology could create. I specifically waited for this phone because they put a battery in it large enough to last a full day of normal use and because the screen was big enough to actually use the device. I was so stoked. I played with it for days, customizing every little tiny feature. I carried it with me everywhere. It became a companion. Don't get me wrong, I don't spend all my time chatting on the phone, text messages are mostly unused, and email can wait until I have a real keyboard to use. But I could turn my lights on using a web browser from the Burger King in town. This is a techie's dream. Then one day I was taking a picture in the back yard and the screen cracked. Yep, it cracked vertically from top to bottom when I touched the little icon on the screen. I couldn't believe it. Here was a device that had a Kevlar case and Gorilla Glass screen and was advertised as being able to handle 'real life' that broke under my index finger. I called the cell phone provider about the problem and met with the, "physical damage is not covered under warranty" line. I argued for almost an hour that taking a picture wasn't damage, it was normal use, but they didn't give an inch. I took it to one of the corporate stores and they did the same thing. I was totally annoyed and actually thought about a little mayhem as a possible route to some degree of satisfaction. I even contacted the manufacturer about it. The result was exactly the same. Their logic is that a cracked screen is a result of damage, not bad design or manufacture. They couldn't possibly be at fault. Having exactly zero success trying to get someone to acknowledge that there was a problem that needed correcting, I used the insurance I bought along with the phone. A hundred bucks later, I had a new phone just like the old one, but the magic was gone. The device was too fragile to trust. I equipped it with an otterbox, which make it boxy and ugly, but it might survive being used and nursed it along. During this time I noticed a slight bulge on the back of the phone; the darn battery was swelling. Yep, the state-of-the-art lithium-ion battery was puffing up and distorting the case. So much for embedded batteries that you can't change; it was failing in one year nine months and bending the back cover. Again on the phone with the provider and they say that it's out of warranty and there's nothing to be done, but I could use the insurance again (another 100 bucks) and get a replacement. I decided not to send good money chasing after bad and continued to treat the phone like a new girl friend until the contract ended. My thinking was that I'd get a different manufacturer's device and maybe have better luck. And, as luck would have it, Samsung announced that their Galaxy 5 would come out in a couple of months; last Friday (the release date) my new phone was delivered to the house (again on the day of release). I'm in love again. The bulge is really obvious, but take a look at the next photo. The case has actually split at a seam and you can see inside the phone if you get a flashlight. 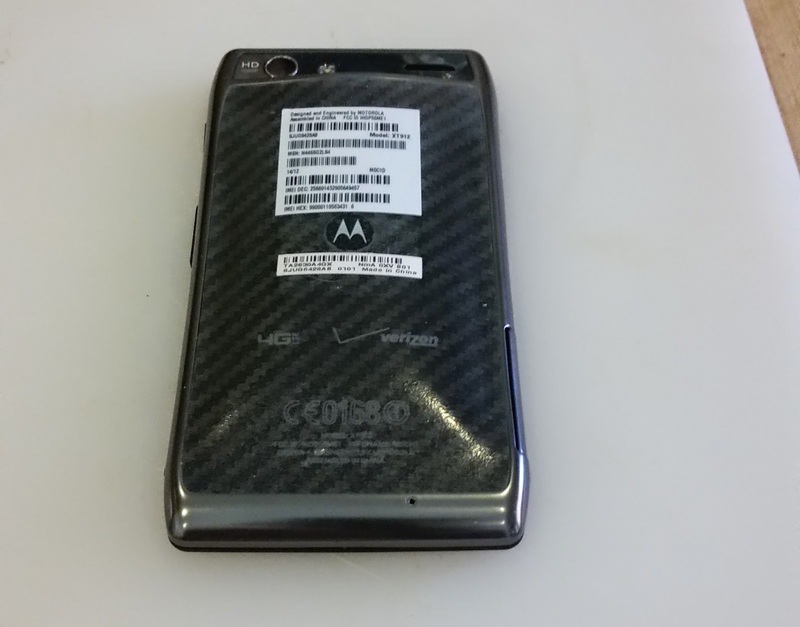 This is the damage that Motorola and Verizon won't warranty because too much time has passed. Just like the crack down the screen they wouldn't cover because of 'physical damage'. The swelling actually broke the speaker on the back, so I couldn't hear a ring; I had to rely on vibrate for the last month. Yes, I know that one should get a case for a cell phone. But doesn't that eliminate the need to make it slim, attractive and stylish? 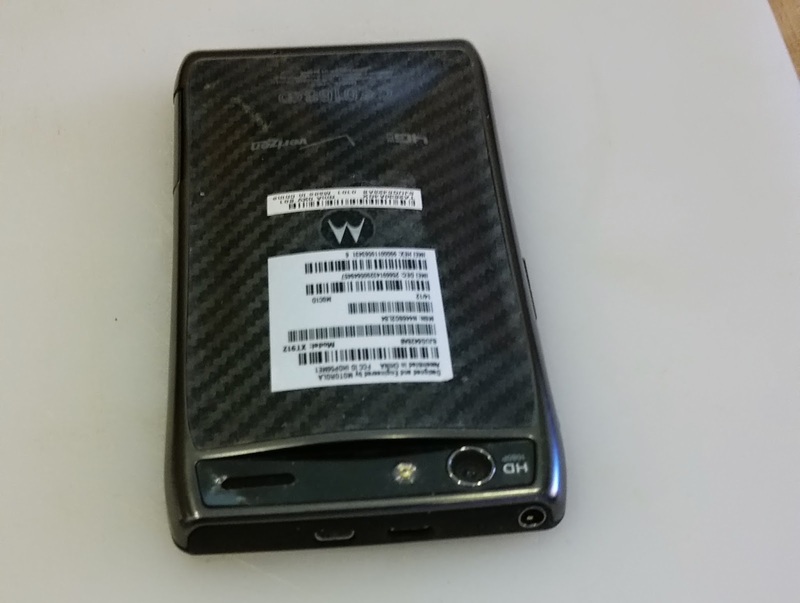 Take a piece of high tech jewelry and hide it inside a poly carbonate case with a silicon protector around it and it looks like a plastic box, not a cell phone. Yes, I know that screens can crack, but when you touch it to take a picture?? What the heck is up with that? That generation of Gorilla Glass doesn't deserve the name. The good thing is that I tested the heck out of the Otterbox case; I'm certain that the case was the only reason I didn't have to replace the phone a couple more times. So ends an annoying chapter of my life. I would change carriers to get away, but no other carrier works out here. Now, I get to play with all the features of a new phone. I get to customize every little thing and put pictures of my dog on it to annoy other people with. Motorola used to be a great company. Maybe Google will bring some of the life back to them since they took over the mobile phone part, but I'm keeping my distance. I suggest you get a case for this one. I went without a case for a long time with my S4 then one day getting out of a taxi, it fell and the screen shattered. I was able to replace the screen with one I bought from Amazon and the phone works fine, but it was a pain to do. I got a Poetic case - they are transparent, slim and tough. Yes, I chickened out and bought a case. The phone's not as pretty, but I feel safer. Stay far from this phone, the gorilla glass screen breaks, even with no effect, and Motorola won't remained by their item. Go somewhere else to purchase a phone. Agreed. I have a Samsung now. I'm a bit late coming to this discussion, but I swore off Motorola products 20 years ago after buying one of their early GSM phones. The Motorola 6200 "Flare" was not of merchantable quality. Apart from numerous warranty repairs, even when it was working as designed, its battery life was appalling (approximately 8 hours, but only if I didn't actually make or receive any calls) and the audio quality was truly dreadful. I changed to Nokia and then much later to Apple and never looked back. I was entranced by the battery life. It really did have a long battery life, even after the battery swelled up and ruined the phone. That part was true. The rest of the product was crap. on this issue. Really.. thank youu for starting tyis up. This web site is something that's needed on thee web, someone with a little originality!